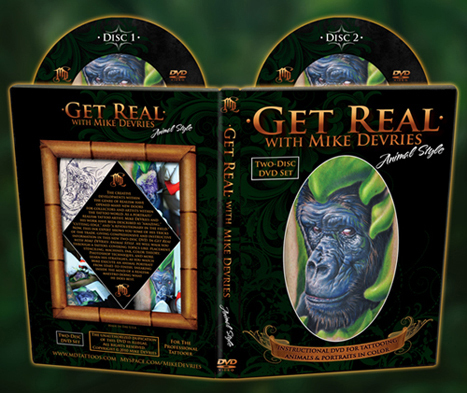 In this DVD I explain each step as I am executing it, rather than providing voice- overs done at a later time. In my opinion, it is much more effective to explain things as I go, as I'm in the right frame of mind tattooing that specific piece, which makes it pertinent to that given piece of instruction. This time around I decided to use coil machines, which are a bit more timeless. I also thought more viewers might prefer seeing me use coils, even though I am currently using Stigma machines. Regardless of which machine I use though, I consistently tattoo the same way. I am very excited about releasing this and hope you enjoy it and gain some new insight. This DVD is for the professional tattooer or apprentice who is learning in a legitimate tattoo shop. It is meant to boost your already-existing skills and give you some new components to consider the next time you approach a realistic tattoo. When ordering this DVD please specify the shop that you work at, so it saves on time (to eliminate the need for us to either write you back or search your name on the Internet to verify that you work at a tattoo shop). Total running time: Disk 1: 3 hours 38 minutes; Disk 2: 3 hours 13 minutes. This new tattoo DVD is now in Stock!